Simply More Listings and Better Search Results! I KNOW what you are looking for. I and my beautiful wife, Lisa have three wonderful boys (Mason - 9yrs., Evan - 7yrs., Tanner - 4yrs) as well as our baby girl Gianna ( 2 yrs ) and our beloved Swiss Mountain Dogs, Harper & Hudson. We are lifetime local residents, active in our community. The desire to own property and leverage my background is the reason why I got into real estate over 16 years ago. I was raised in Milton where my family still resides after 46 years. They have owned a contracting/renovation business for over four decades and I have accumulated much of my construction/renovation experience from them – as well as earning my Construction Supervisor and Builders licenses. 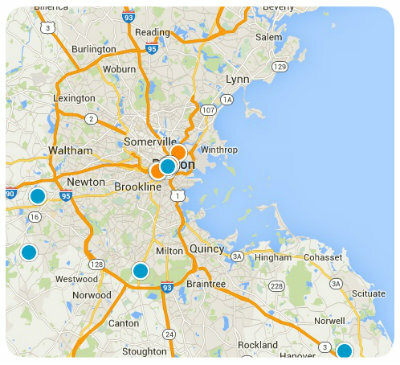 I lead the most active and highly rated Real Estate Team servicing Eastern MA. Searching for properties online can be daunting and frustrating. In an attempt to find the right resource, all too often all that results is being inundated with spam and calls from inexperienced or non-local agents. Despite the multitude of confusing information, I am pleased that you have found me and my team of local experts to assist you further in your search. We have been thoroughly vetted by Realtor.com, Trulia, Zillow, Movoto, Homesnap and Success! Real Estate to assist our clients in finding the best home for them at the best price and terms. There is a reason we are the #1 rated team in MA on most national real estate websites - as rated by our previous clients. Our portfolio is full of clients who have procured properties for $5,000 - $20,000 UNDER what others have paid for the same home. I would love the opportunity to show you how we do it. I pride myself on finding the ideal opportunities for my client's needs all while protecting their best interests in the process. There is no one who will work harder or more professionally for you to ensure you get the home of your dreams. Please contact me to discuss your next home - as always, there is no cost to you as the buyer and never any contracts or obligation. South Shore Listings from the last 5 minutes!